A 4-year-old boy with autism from New York who vanished from his grandmother's house in South Carolina Christmas Eve was found drowned in a nearby pond nearly two days after he went missing, authorities said. 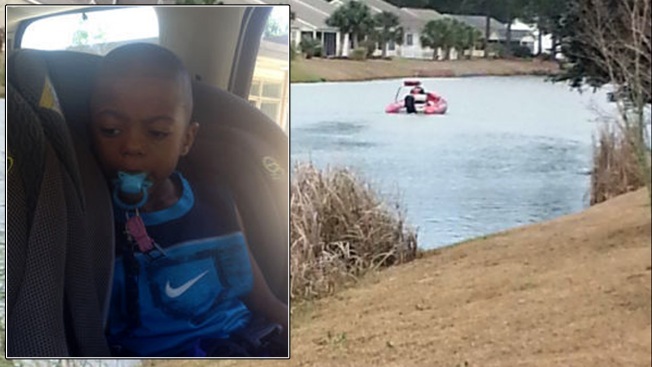 The body of Jayden Morrison, of White Plains, was found around 11 a.m. Friday in a retention pond behind two homes in Little River, not far from where he was last seen less than 48 hours earlier, officials with the Horry County Police Department said. The boy, who had last been seen wearing only his pajamas, was found by a medic volunteer as the water levels in the pond began to recede after several days of rain. His pajamas were still on. Hundreds of emergency workers and volunteers searched through Christmas Day for the little boy. His mother had left him with his grandmother while she went to Wal-Mart Wednesday evening, and when the grandmother turned her back for a moment, the child was gone, police said. Police said they believe he wandered away from his grandmother's home and stumbled into the pond about 10 houses down the road. "Our thoughts and prayers are with the Morrison family at this difficult time," Horry County Police Department Lt. Raul Denis said in a statement. Divers searched ponds in a 5-square mile area near the community between Myrtle Beach and the North Carolina border. Drones, helicopters and four-wheelers also were used in the search. The child's mother, Tabatha Morrison, told NBC Myrtle Beach affiliate WMBF News Thursday that the family arrived at her mother's house on Christmas Eve from New York. She said her son was non-communicative and likely would not be able to find his way home because he was not familiar with his grandmother's neighborhood, and pleaded for help. "He's never been out of our eyesight, he's never walked out of the door before," the mother said with tears in her eyes. "And they've searched everywhere. Where could he be?" The mother said that Jayden's twin, Jordan, stayed up until 4 a.m. Christmas morning waiting for his brother to return home. The child's father also joined the search Thursday.